Shaving Creams: Herban Cowboy, Naturally Dapper, Every Man Jack! • Natural Grooming After Shave Balm: Dusk After Shave Balm moisturizer boosts replenishing and healing of the skin post shave. Made with organic Carrot, Cucumber, and Shea Butter in a rich, cream base for the nourishing skin conditioning lotion. Dries matte. Dusk scent is a musky, masculine and rugged scent. 3.5 oz. ORDER TODAY! Ingredients: Aloe Vera (Aloe Barbadensis) Leaf Juice, Butyrospermum Parkii (Shea Butter), Helianthus Annuus (Sunflower) Seed Oil, Stearic Acid, Fragrance, Rosmarinus Officinalis (Rosemary) Leaf Extract, Cucumis Sativa (Cucumber) Fruit Extract, Daucus Carota Sativa (Carrot) Extract, Hydrolyzed Rice Protein, Tocopherol (Natural Vitamin E), Cyamopsis Tetragonoloba (Guar Gum). 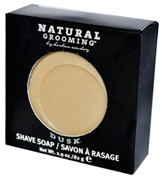 • Natural Grooming Shave Cream: Dusk Shave Cream is non-lathering, skin conditioning and calming. Blended with Lavender, Menthol and Aloe helps soothe and preconditions the skin for a gentle shave. 6.7 oz. ORDER TODAY! Ingredients: Aloe Vera (Aloe Barbadensis) Leaf Juice, Aqua/Water/Eau, Potassium Oleate, Potassium Cocoate, Glycerin, Stearic Acid, Fragrance, Rosmarinus Officinalis (Rosemary), Rosmarinus Officinalis (Rosemary) Extract, Hydrastis Canadensis (Goldenseal) Root Extract, Lavandula Angustifolia (Lavender) Flower Extract, Mentha Piperita (Peppermint) Leaf Extract, Salvia Officinalis (Sage) Leaf Extract, Achillea Millefolium (Yarrow) Extract, Tocopherol (Natural Vitamin E), Sodium Chloride, Citric Acid. • Natural Grooming Shave Soap: Dusk Shave Soap with its round shave soap fits in most standard shave mugs for use with shave brush. Provides good lather, long lasting with dusk fragrance. 2.9 oz. ORDER TODAY! Ingredients: Saponified Coconut and Palm Oils, Water, Glycerin, Fragrance, Rosmarinus Officinalis (Rosemary) Leaf Extract. (Dusk - Kelp and Pumice; Wild - Cucumber and Rose Clay; Original - Ginger and Carrot; BlueGrass - Parlsey and Chlorophyl). • Natural Grooming Dusk Blend Cologne: The world's first cologne that has been certified organic. Dusk Dusk Cologne with a natural masculine scent free of phthalates, vegan and 100% US made and recyclable. 1.7 oz. ORDER TODAY! Ingredients: Denatured Alcohol (Distilled From Corn), Fragrance. MEN'S SHAVING: Dusk After Shave Balm, 3.5 oz. Dusk Shave Cream, 6.7 oz. MEN'S SHAVING: Dusk Shave Soap, 2.8 oz. MEN'S SHAVING: Cologne Dusk Blend, 1.7 oz. • Shave Cream Moisturizing:100% natural formula exclusively created to help lock in your skin's moisture to prevent skin tightness and redness. Made with Olive Oil helps provide a protective barrier to lock in your moisture and protect your skin. Jojoba Oil extracts and Panthenol gently helps soften your skin. Fragranced with revitalizing Lime and Spearmint essential oils. 8.8 oz. ORDER TODAY! • Shave Cream Sensitive: 100% natural formula helps prevent razor burn and provide a close, comfortable shave and keep you looking dapper. Blended with Aloe to protect and calm skin and Vitamin E to help prevent redness and irritation. Unscented and free of dyes. 8.8 oz. ORDER TODAY! Ingredients: Water, Sodium Laurylglucosides Hydroxypropylsulfonate (plant based emolient), Glycerin (plant based emolient), Aloe Barbadensis Leaf Juice (Aloe), Glyceryl stearate (plant based moisturizer), Stearic Acid (plant based moisturizer), Cetyl Alcohol Caprylic/Capric Triglyceride, Propanediol (plant based moisturizer), Coco-Caprylate, Hydrolised Jojoba Esters (Jojoba oil extract), Olea Europaea (Olive) Fruit Oil, Panthenol (provitamin B5), Tocopherol Acetate (vitamin E), Xanthan Gum, Glyceryl Caprylate, Glyceryl Undecylenate. • Aftershave Balm Cream Moisturizing: Helps moisturize. Light Lime and Spearmint fragrance for a cooling and soothing feeling after your shave.Made with Aloe to calm, Vitamin E helps heal irritated skin, and super ingredients Squalene and Shea Butter intensely hydrate without clogging pores. Helps absorb fast and retains moisture without feeling greasy or heavy. Vegan, Free of dyes, parabens, drying alcohol, SLS and soap. 6 oz. ORDER TODAY! • Aftershave Balm Sensitive: Unscented to reduce irritation for sensitive skin. Made with Aloe to calm, Vitamin E helps heal irritated skin, and super ingredients Squalene and Shea Butter intensely hydrate without clogging pores. Helps absorb fast and retains moisture without feeling greasy or heavy. Vegan, Free of dyes, parabens, drying alcohol, SLS and soap. 6 oz. ORDER TODAY! • Exfoliating Face Scrub Cream Moisturizing: Made with Walnut powder to gently exfoliate, clears away dirt and lifts hair to prep skin for a great shave. Blended with enhanced Aloe (Aloe with Vitamin E) helps offer brilliant hydrating. Squalene and Shea Butter intensely hydrate without clogging pores. Light Lime and Spearmint fragrance. Vegan, Free of dyes, parabens, drying alcohol, SLS and soap. 6 oz. ORDER TODAY! • Exfoliating Face Scrub Sensitive: Made with improved Aloe to calm and Vitamin E helps restore irritated, sensitive skin. Squalene and Shea Butter intensely hydrate without blocking pores. Helps absorb fast and retains moisture without feeling greasy or heavy. Vegan, Free of dyes, parabens, drying alcohol, SLS and soap. Unscented to reduce irritation. 6 oz. ORDER TODAY! MEN'S SHAVING: Shave Cream, 8.8 oz. MEN'S SHAVING: Aftershave Balm, 6 oz. MEN'S SHAVING: Exfoliating Face Scrub, 6 oz. • Mann After Shave Lotion: mann After Shave Lotion help comfort irritated, reddened skin and heals tiny shaving nicks with a scent of spicy masculine notes of fine woods. Blended with valuable active ingredients such as Licorice Root soothe the skin after shaving. This After Shave Lotion rejuvenates and calms your skin. Leaves a fresh-feeling skin after shaving. 3.4 oz. Germany. ORDER TODAY! Ingredients: Alochol Aqua (Water) Polyglyceryl-10 Laurate Sodium PCA Glycerin Dipotassium Glycyrrhizate Caffeine, Ginkgo Biloba Leaf Extract Sodium Hyaluronate Citric Acid Parfum (Essential Oils) Limonene Linalool Citral . • Mann After Shave Balm: The LOGONA man Aftershave Balm with its spicy, masculine scent from exquisite woods delivers a nourished skin after shaving. Blended with the invigorating organic Caffeine, revitalizing organic Ginkgo and nurturing organic Tiger Nut Oil to provide your skin a powerful moisture boost while leaving it silky smooth and supple. 1.7 oz. Germany. ORDER TODAY! Ingredients: Aqua (Water), Alcohol denat., Glycerin, Sorbitol, Prunus Amygdalus Dulcis (Sweet Almond) Oil, Glyceryl Stearate Citrate, Glycine Soja (Soybean) Oil, Butyrospermum Parkii (Shea) Butter, Isoamyl Laurate, Cyperus Esculentus Root Oil, Xanthan Gum, Dipotassium Glycyrrhizate, Ginkgo Biloba Leaf Extract, Caffeine, Sodium Lactate, Lactic Acid, Tocopherol, Sodium Hyaluronate, Helianthus Annuus (Sunflower) Seed Oil, Parfum (Essential Oils), Limonene, Linalool, Citral. • Mann Shaving Foam: The LOGONA man Shaving Foam is ultra-fine and soothing for a soft, gentle shave. The cherished blend of Liquorice Root, organic Ginkgo and organic Caffeine guards the skin from irritations and thoroughly prepare for shaving. The Shaving Foam is mainly blade-friendly. Provides a spicy, masculine fragrance of exquisite woods. Vegan and gluten free. 6.8 oz. Germany. ORDER TODAY! Ingredients: Aqua (Water), Vitis Vinifera (Grape) Seed Oil, Alcohol, Glycerin, Glycine Soja (Soybean) Oil, Sodium Cocoyl Glutamate, Disodium Cocoyl Glutamate, Prunus Amygdalus Dulcis (Sweet Almond) Oil, Cyperus Esculentus Root Oil, Dipotassium Glycyrrhizate, Galactoarabinan, Ginkgo Biloba Leaf Extract, Sodium Levulinate, Citric Acid, Xanthan Gum, Sodium Anisate, Caffeine, Tocopherol, Helianthus Annuus (Sunflower) Seed Oil, Parfum (Essential Oils), Limonene, Linalool. • Mann Shaving Cream: The mild and creamy LOGONA man Shaving Cream softens chin hair and allows an exceptionally smooth, gentle shave. A selection of calming plant extracts such as organic Ginkgo and organic Caffeine reduces redness and irritation during wet-shaving. Provides a spicy, masculine aroma of exquisite woods. 2.5 oz. Germany. ORDER TODAY! Ingredients: Aqua (Water), Palmitic Acid, Stearic Acid, Glycerin, Potassium Hydroxide, Lauric Acid, Myristic Acid, Simmondsia Chinensis (Jojoba) Seed Oil, Lanolin, Glyceryl Stearate SE, Dipotassium Glycyrrhizate, Ginkgo Biloba Leaf Extract, Caffeine, Sodium Hyaluronate, Potassium Silicate, Sodium Hydroxide, Parfum (Essential Oils), Limonene, Linalool. MEN'S SHAVING: Mann After Shave Lotion, 3.4 oz. MEN'S SHAVING: Mann After Shave Balm, 1.7 oz. MEN'S SHAVING: Mann Shaving Foam, 5.1 oz. MEN'S SHAVING: Mann Shaving Cream, 2.5 oz. • Fragrance Free Sensitive Skin Shave Gel: Get a smooth, close shave with this rich, Shave Gel for all skin types. Made with Chamomile extract to help calm and moisturize, Aloe and Vitamin E restores and protects, and Glycerin helps skin retain moisture. A light Signature Mint fragrance rejuvenates. Apply by lathering to a clean, wet face. Shave, rinse, and finish with face lotion. 7 oz. ORDER NOW! Ingredients: Aqua/Water/Eau, Palmitic Acid, Triethanolamine, Sorbitan Stearate, Methyl Gluceth-20, Stearic Acid, Aloe Barbadensis (Aloe Vera) Leaf Juice, Isopentane, Sorbitol, Sunflower Seed Oil Glycerides, Phenoxyethanol, Glycerin, Caprylic/Capric Triglyceride, Isobutane, Hydroxyethylcellulose, Dimethicone Peg/PPG-20/23 Benzoate, Dimethicone Peg-8 Benzoate, Panthenol, Hydroxypropyl Methylcellulose, Anthemis Nobilis (Chamomile) Flower Extract, Tocopheryl Acetate, Sodium Chloride. • Fragrance Free All Skin Types Shave Cream: Luxurious, low-foam Shave Cream helps soften and prep your skin and beard for a comfortable shave. Made with Olive oil extract to moisturize, Chamomile calms, and Aloe restores. Won't dry out skin or clog pores. Fragrance free for sensitive skin. 6.7 oz. ORDER NOW! Ingredients: Aqua/Water/Eau, Stearic Acid, Palmitic Acid, Squalane, Hydrogenated Polydecene, Polysorbate 60, PEG-100 Stearate, Glyceryl Stearate, Myristyl Alcohol, Helianthus Annuus (Sunflower) Seed Oil, Caprylic/Capric Triglyceride, Cetyl Alcohol, Butylene Glycol, Stearyl Alcohol, Olea Europaea (Olive) Fruit Oil, Allantoin, Sodium PCA, Aloe Barbadensis Leaf Juice, Chamomilla Recutita (Matricaria) Flower Extract, Stearamidopropyl Dimethylamine, Polybutene, Xanthan Gum, Propylene Glycol, Triethanolamine, Phenoxyethanol, Ethylhexylglycerin, Titanium Dioxide. • Fragrance Free Pre Shave Face Scrub: Effective, gentle Pre Shave Face Scrub helps deep clean to remove dirt and oil. Made with Coconut-derived surfactants to clean, and Jojoba beads exfoliate dry and dead skin. Blended with Chamomile, organic Aloe, and Vitamin E to calm, and Glycerin helps moisturize. Fragrance free for sensitive skin. 5 oz. ORDER NOW! Ingredients: Aqua/Water/Eau, Jojoba Esters, Sorbitol, Helianthus Annuus (Sunflower) Seed Oil, Decyl Glucoside, Glycerin, Aloe Barbadensis Leaf Juice, Lavandula Angustifolia (Lavender) Extract, Calendula Officinalis Flower Extract, Chamomilla Recutita (Matricaria) Flower Extract, Simmondsia Chinensis (Jojoba) Seed Extract, Cucumis Sativus (Cucumber) Fruit Extract, Prunus Amygdalus Dulcis (Sweet Almond Seed) Extract, Stearyl Alcohol, Crithmum Maritimum(Sea Fennel) Extract, Bisabolol, Allantoin, Panthenol, Rosa Canina Fruit Extract, Sodium Carbomer, Tocopherol, Phenoxyethanol, Ethylhexylglycerin, Magnesium Ascorbyl Phosphate (Vitamin C). • Fragrance Free Face Wash Skin Clearing: Face Wash Skin Clearing helps improve skin clarity and texture, and stop breakouts before they start. Wash away deep-down dirt and oil for clearer looking skin. Blended with Salicylic Acid to treat and prevent breakouts, Coconut-derived surfactants gently clean. Aloe, Chamomile, and Glycerin calm and moisturize. Use morning, night, and before shaving. 5 oz. ORDER NOW! Active Ingredients: Salicylic Acid 2.0%. Inactive Ingredients: Aqua/Water/Eau, Aloe Barbadensis Leaf Juice, Disodium C14-16 Olefin Sulfonate, Cocomidopropyl Betaine, Sodium Cocoyl Glutamate, Sodium Cocoyl Isethionate, Glycerin, Citric Acid, Panthenol (Vitamin B5), Napca, Magnesium Ascorbyl Phosphate, Allantoin, Arnica Extract, White Tea Extract, Chamomile Extract, Rose Hip Oil, Borage Oil, Flax Seed Oil, Potassium Sorbate, Sodium Benzoate, Ethyl Hexyl Glycerin. • Fragrance Free Post Shave Face Lotion: Light, non-greasy Post Shave Face Lotion helps moisturize and restore, and perfect for dry or razor irritated skin. Made with Menthyl and Chamomile to help calm, Shea Butter to moisturize, and Vitamin E to restore. Use on clean skin morning and night, and always after shaving. Fragrance free for sensitive skin. 4.2 oz. ORDER NOW! • Fragrance Free Face Lotion SPF15: Light, non-greasy Face Lotion SPF15 helps moisturize and heal that's prefect for dry or razor irritated skin. With SPF 15 Daily Protection helps keeping yourself safe from the sun's damaging rays. Use generously on a clean face, neck, and head for everyday protection, and always after shaving. Reapply after working out. Fragrance free for sensitive skin. 3.2 oz. ORDER NOW! Ingredients: Active Ingredients: Octinoxate 7.5%, Octisalate 5%, Oxybenzone 3%. Inactive Ingredients: Aqua/Water/Eau, Glycerin, Aloe Barbadensis Leaf Juice, Glyceryl Stearate, Stearate, Caprylic/Capric Triglyceride, Cetearyl Alcohol, Stearic Acid, Sodium Carbomer, Allantoin, Panthenol, Chamomilla Recutita (Matricaria) Flower Extract, Arnica Montana Flower Extract, Calendula Officinalis Flower Extract, Camellia Sinensis Leaf Extract, Lavandula Angustifolia (Lavender) Extract, Magnesium Ascorbyl Phosphate, Tocopherol, Sodium Hyaluronate, Lecithin, Dimethicone, Polyglyceryl-4 Isostearate, Hexyl Laurate, Phenoxyethanol, Ethylhexylglycerin, Benzyl Alcohol. • Premium Shave Shave Cream Cedarwood: Shave Cream Cedarwood is a brush or brushless formula that provides a richer and fuller lather. Made with Glycerin and organic Sunflower oil to lubricate and protect. Organic Aloe and Vitamin E help restore and calm. Vitamin B5 moisturizes and essential oils of Rosemary and Sage rejuvenate. 8 oz. ORDER NOW! Ingredients: Aqua/Water/Eau, Aloe Barbadensis Leaf Juice, Potassium Stearate, Glycerin, Tocopheryl Acetate (Vitamin E), Panthenol (Vitamin B5), Linum Usitatissimum (Linseed) Seed Oil, Helianthus Annuus (Sunflower) Seed Oil, Borago Officinalis (Borage) Seed Oil, Allantoin, Bisabolol, Phenoxyethanol, Ethyl Hexyl Glycerin, Salvia Sclarea (Clary Sage) Oil, Rosmarinus Officinalis (Rosemary) Oil, Juniperus Virginiana Wood Extract, Fragrance/Parfum. • Premium Shave Shave Brush: Shave Brush helps soften and prep your beard for a more professional shave. Ultra-soft, man-made bristles gently massage and exfoliate while creating a richer and fuller lather. The woodgrain handle is ergonomically comfortable and forever classic. 2 oz. ORDER NOW! MEN'S SHAVING: Shave Gel Fragrance Free, 7 oz. Shave Cream, 7 oz. | Face Scrub, 5 oz. |Face Wash Skin Clearing 5 oz. Face Lotion, 4.2 oz. | Face Lotion SPF15, 3.2 oz. MEN'S SHAVING: Shave Cream Cedarwood, 8 oz. • Smooth Shave Toner: Skin becomes tightened and refined by this revitalizing toner. It's a powerful tonic that's ideal to use before and after you shave to prep and tone your face. Small shaving wounds are soothed with the astringent and antiseptic properties of Myrrh, a calming natural extract with a distinct, spicy fragrance. Your face experiences invigorated, restored, conditioned and cleansed. 3.4 oz. ORDER TODAY! Ingredients: Squalene, Water (Aqua), Hamamelis Virginiana (Witch Hazel) Distillate, Fragrance (Parfum), Limonene, Linalool, Geraniol, Citral, Commiphora Myrrha (Myrrh) Extract. • After Shave Balm: Organic Jojoba seed oil absorbs fast to guard your skin without leaving an oily film. Biodynamic® Aloe is abundant in vitamins, minerals and enzymes that nurture and calm razor burn. Myrrh has gentle antiseptic and astringent properties that soothe small shaving wounds. Your face feels supple, silky and relaxed. 3.4 oz. ORDER TODAY! Ingredients: Water (Aqua), Prunus Amygdalus Dulcis (Sweet Almond) Oil, Lanolin, Sesamum Indicum (Sesame) Seed Oil, Kaolin, Squalene (Squalene), Hydrolyzed Beeswax, Glyceryl Linoleate, Silica (Silica), Calendula Officinalis (Calendula) Flower Extract, Chamomilla Recutita Matricaria (Chamomile), Fragrance (Parfum), Limonene, Linalool, Geraniol, Citral, Geraniol, Citral, Coumarin, Farnesol. • Shaving Cream: Supplement your skin's natural moisture balance with the essential fatty acids in sweet Almond oil. Organic Pansy extract is conditions your skin and calm irritation. Goat's milk is rich in emollients that soften your skin. Your face is left looking and feeling soft, clean-cut and flawless. Provides smooth skin and an alluring herbal scent, gets primed for shaving and guard from cuts, and a skin-softening, wet shave treatment for sensitive skin. 2.5 oz. ORDER TODAY! Ingredients: Aqua (Water), Potassium Stearate, Glycerin, Potassium Olivate, Potassium Cocoate, Sodium Stearate, Fragrance (Parfum), Viola Tricolor (Pansy) Extract, Prunus Amygdalus Dulcis (Sweet Almond) Fruit Extract, Caprae Lac (Goat Milk), Sodium Olivate, Sodium Cocoate, Sodium Silicate, Magnesium Sulfate, Squalene, Limonene, Linalool, Citronellol. 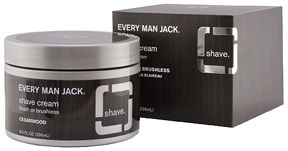 MEN'S SHAVING: Shaving Cream, 2.5 oz. Bulldog shave products contain unique essential oil blends and amazing natural active ingredients to improve performance. Be loyal to your skin. Our products never contain parabens, sodium laureth sulfate, artificial colours, synthetic fragrances, or ingredients from animal sources. • Original Shave Gel: Original Shave Gel is packed with 8 essential oils, aloe vera, jojoba and konjac mannan for an incredibly smooth shave. 5.9 oz. ORDER TODAY! Ingredients: Aqua (Water), Aloe Barbadensis (Aloe Vera) Leaf Juice, Cocamidopropyl Betaine, Glycerin, Coco-Glucoside, Acrylates /C10-30 Alkyl Acrylate Crosspolymer, Phenoxyethanol, Sodium Chloride, Sodium Hydroxide, Benzoic Acid, Menthol, Simmondsia Chinensis (Jojoba) Seed Oil, Dehydroacetic Acid, Mannan, Citrus Aurantium Bergamia (Bergamot) Peel Oil, Citrus Limon (Lemon) Peel Oil, Ethylhexylglycerin, Artemisia Vulgaris Oil, Polyaminopropyl Biguanide, Pelargonium Graveolens Oil, Pogostemon Cablin (Patchouli) Oil, Potassium Sorbate, Citrus Aurantifolia (Lime) Oil, Evernia Furfuracea (Treemoss) Extract, Juniperus Virginiana Oil, Vetiveria Zizanoides Root Oil, Citric Acid, Limonene. • Sensitive Face Wash: Gentle and non-drying, it leaves your skin feeling revitalized and free of dirt and debris. Made for sensitive skin with 2 essential oils and Green Tea to gently cleanse your face of dirt and debris. 5 oz. ORDER TODAY! Ingredients: Aqua (Water), Cocamidopropyl betaine, Coco-glucoside, Glycerin, Sodium lauroyl sarcosinate, Acrylates /C10-30 alkyl acrylate crosspolymer, Phenoxyethanol, Sodium chloride, Sodium hydroxide, Benzoic acid, Sodium laurate, Dehydroacetic acid, Camellia sinensis (Green tea) leaf extract, Cedrus atlantica (Cedarwood) bark oil, Sodium sarcosinate, Pogostemon cablin (Patchouli) oil. • Original After Shave Balm: Original After Shave Balm is packed with 8 essential oils, green tea, konjac mannan, rosehip oil and vitamin E to help nourish and soothe the skin. Apply to face after shaving. 2.5 oz. ORDER TODAY! Ingredients: Aqua (Water), Aloe Barbadensis (Aloe Vera) Leaf Juice, Ethylhexyl Palmitate, Glycerin, Caprylic/Capric Triglyceride, Rosa Eglentaria (Rosehip) Seed Oil, Sorbitan Stearate, Phenoxyethanol, Allantoin, Pentaerythrityl Distearate, Sodium Polyacrylate, Anthemis Nobilis (Chamomile) Flower Extract, Sodium Stearoyl Glutamate, Helianthus Annuus (Sunflower) Seed Oil, Benzoic Acid, Carbomer, Cucumis Sativus (Cucumber) Seed Oil, Tocopherol, Dehydroacetic Acid, Mannan, Camellia Sinensis (Green Tea) Leaf Extract, Calendula Officinalis (Marigold) Flower Oil, Sodium Hydroxide, Citrus Aurantium Bergamia (Bergamot) Peel Oil, Citrus Limon (Lemon) Peel Oil, Potassium Sorbate, Artemisia Vulgaris Oil, Citric Acid, Pelargonium Graveolens Oil, Pogostemon Cablin (Patchouli) Oil, Citrus Aurantifolia (Lime) Oil, Evernia Furfuracea (Treemoss) Extract, Juniperus Virginiana Oil, Vetiveria Zizanoides Root Oil, Limonene, Linalool. • Sensitive Shave Cream: If you've got the kind of skin that acts up, then this shave cream will be much more effective than Byron or Keats at satisfying your sensitive side. Specially formulated for sensitive skin with 2 essential oils, Aloe Vera, Jojoba, Sunflower oil and Shea butter for a smooth shave. 5.9 oz. ORDER TODAY! Ingredients: Aqua (Water), Stearic Acid, Helianthus Annuus (Sunflower) Seed Oil, Aloe Barbadensis (Aloe Vera) Leaf Juice, Glyceryl Stearate, Coco-Glucoside, Butyrospermum Parkii (Shea Butter), Glycerin, Sodium Cocoyl Glutamate, Cetearyl Alcohol, Glycereth-26, Phenoxyethanol, Benzoic Acid, Xanthan Gum, Cedrus Atlantica (Cedarwood) Bark Oil, Simmondsia Chinensis (Jojoba) Seed Oil, Dehydroacetic Acid, Mannan, Ethylhexylglycerin, Citric Acid, Pogostemon Cablin (Patchouli) Oil, Polyaminopropyl Biguanide, Potassium Sorbate. Original Shave Gel, 5.9 oz. Sensitive Face Wash, 5 oz. Original After Shave Balm, 2.5 oz. Sensitive Shave Cream, 5.9 oz. MEN'S SHAVING: Original After Shave Balm, 2.5 oz. Moisture Shaves: 4-in-1 Moisture Shave is wonderfully moisturizing cream for a difference you can see and feel. (1) Vitamin E and oils soften your skin. (2) This formula delivers a smooth, close shave. (3) Golden Seal, Lemongrass and Aloe help to soothe. (4) Olive and Coconut Oils hydrate. Nourish naturally and provides a comfy shave. 11 oz. BUY NOW! • Cool Mint: A crisp, freshening Cool Mint scent for a uplifting close shave. 11 oz. BUY NOW! Ingredients: Aqua, Myristic Acid, Glycerin, Stearic Acid, Potassium Hydroxide, Cocos Nucifera (Coconut) Oil, Olea Europaea (Olive) Fruit Oil, Aloe Barbadensis (Aloe Vera) Leaf Juice, Tocopheryl Acetate (Vitamin E), Allantoin, Salvia Officinalis (Sage) Leaf Extract, Arnica Montana (Arnica) Flower Extract, Hydrastis Canadensis (Golden Seal) Root Extract, Equisetum Hyemale (Horsetail) Extract, Alchemilla Vulgaris (Lady's Mantle) Leaf Extract, Cymbopogon Schoenanthus (Lemongrass) Leaf Extract, Citrus Aurantifolia (Lime) Fruit Extract, Citrus Aurantium Dulcis (Orange) Flower Extract, Saponaria Officinalis (Soapwort) Root Extract, Nasturtium Officinalis (Watercress) Leaf Extract, Mentha Piperita (Peppermint) Leaf Oil, Hydroxyethylcellulose. • Fragrance Free: This Fragrance Free formula is great for a close shave, and sensitive skin. 11 oz. BUY NOW! Ingredients: Aqua, Myristic Acid, Glycerin, Stearic Acid, Potassium Hydroxide, Cocos Nucifera (Coconut) Oil, Olea Europaea (Olive) Fruit Oil, Aloe Barbadensis (Aloe Vera) Leaf Juice, Tocopheryl Acetate (Vitamin E), Allantoin, Salvia Officinalis (Sage) Leaf Extract, Arnica Montana (Arnica) Flower Extract, Hydrastis Canadensis (Golden Seal) Root Extract, Equisetum Hyemale (Horsetail) Extract, Alchemilla Vulgaris (Lady's Mantle) Leaf Extract, Cymbopogon Schoenanthus (Lemongrass) Leaf Extract, Citrus Aurantifolia (Lime) Fruit Extract, Citrus Aurantium Dulcis (Orange) Flower Extract, Saponaria Officinalis (Soapwort) Root Extract, Nasturtium Officinalis (Watercress) Leaf Extract, Hydroxyethylcellulose. • Key Lime: A stimulating touch of Key Lime for a delightfully close shave. 11 oz. BUY NOW! • Lavender & Shea: The calming scent of Lavender with hydrating Shea Butter for a silky smooth shave. 11 oz. BUY NOW! Ingredients: Aqua, Myristic Acid, Glycerin, Stearic Acid, Potassium Hydroxide, Cocos Nucifera (Coconut) Oil, Olea Europaea (Olive) Fruit Oil, Aloe Barbadensis (Aloe Vera) Leaf Juice, Tocopheryl Acetate (Vitamin E), Allantoin, Butyrospermum Parkii (Shea) Nut Butter, Salvia Officinalis (Sage) Leaf Extract, Arnica Montana (Arnica) Flower Extract, Hydrastis Canadensis (Golden Seal) Root Extract, Equisetum Hyemale (Horsetail) Extract, Alchemilla Vulgaris (Lady's Mantle) Leaf Extract, Cymbopogon Schoenanthus (Lemongrass) Leaf Extract, Citrus Aurantifolia (Lime) Fruit Extract, Citrus Aurantium Dulcis (Orange) Flower Extract, Saponaria Officinalis (Soapwort) Root Extract, Nasturtium Officinalis (Watercress) Leaf Extract, Lavandula Angustifolia (Lavender) Flower Oil, Hydroxyethylcellulose. • Peaceful Patchouli: Peace, love and Patchouli for a flower power close shave. 11 oz. BUY NOW! Ingredients: Aqua, Myristic Acid, Glycerin, Stearic Acid, Potassium Hydroxide, Cocos Nucifera (Coconut) Oil, Olea Europaea (Olive) Fruit Oil, Aloe Barbadensis (Aloe Vera) Leaf Juice, Tocopheryl Acetate (Vitamin E), Allantoin, Pogostemon Cablin (Patchouli) Oil, Salvia Officinalis (Sage) Leaf Extract, Arnica Montana (Arnica) Flower Extract, Hydrastis Canadensis (Golden Seal) Root Extract, Equisetum Hyemale (Horsetail) Extract, Alchemilla Vulgaris (Lady's Mantle) Leaf Extract, Cymbopogon Schoenanthus (Lemongrass) Leaf Extract, Citrus Aurantifolia (Lime) Fruit Extract, Citrus Aurantium Dulcis (Orange) Flower Extract, Saponaria Officinalis (Soapwort) Root Extract, Nasturtium Officinalis (Watercress) Leaf Extract, Hydroxyethylcellulose. • Green Tea Bamboo: Antioxidant Green Tea & Bamboo for an invigorating close shave. 11 oz. BUY NOW! Ingredients: Aqua, Myristic Acid, Glycerin, Stearic Acid, Potassium Hydroxide, Cocos Nucifera (Coconut) Oil, Olea Europaea (Olive) Fruit Oil, Aloe Barbadensis (Aloe Vera) Leaf Juice, Tocopheryl Acetate (Vitamin E), Allantoin, Camellia Sinensis (Green Tea) Leaf Extract, Salvia Officinalis (Sage) Leaf Extract, Arnica Montana (Arnica) Flower Extract, Hydrastis Canadensis (Golden Seal) Root Extract, Equisetum Hyemale (Horsetail) Extract, Alchemilla Vulgaris (Lady's Mantle) Leaf Extract, Cymbopogon Schoenanthus (Lemongrass) Leaf Extract, Citrus Aurantifolia (Lime) Fruit Extract, Citrus Aurantium Dulcis (Orange) Flower Extract, Saponaria Officinalis (Soapwort) Root Extract, Nasturtium Officinalis (Watercress) Leaf Extract, Bambusa Vulgaris (Bamboo) Extract, Natural Fragrance Hydroxyethylcellulose. • Pomegranate Grapefruit: A refreshing and fruity Pomegranate Grapefruit formula for an amazingly close shave. 11 oz. BUY NOW! Ingredients: Aqua (Water), Stearic acid, Helianthus annuus (Sunflower) seed oil, Aloe barbadensis leaf juice, Glyceryl stearate, Coco-glucoside, Butyrospermum parkii (Shea butter), Glycerin, Sodium cocoyl glutamate, Cetearyl alcohol, Glycereth-26, Phenoxyethanol, Benzoic acid, Xanthan gum, Cedrus atlantica bark oil, Simmondsia chinensis (Jojoba) Seed oil, Dehydroacetic acid, Mannan, Ethylhexylglycerin, Citric acid, Pogostemomn cablin oil, Polyaminopropyl biguanide, Potassium sorbate. MEN'S SHAVING: 4-in-1 Moisture Shave, 11 oz. Moisturizing Cream Shave: This rich, moisturizing cream shave applies easily over skin, offers razor lift and glide, washes clean and calms sensitive skin for a perfect shave. Essential Oil and the rich Oat nutrition of Beta Glucan nurture skin while helping accelerate repair of nicks and skin irritation. 8 oz. ORDER TODAY! • Lavender:Lavender Essential Oil, Aloe, Beta-Glucan and plant extracts offer vital smooth razor glide while they intensely nurture for a supple, close shave with added moisture relief. Ingredients: Aloe Barbadensis Leaf Juice, Aqua (Water), Stearic Acid, Caprylic/Capric Triglyceride, Helianthus Annuus (Sunflower) Seed Oil, Cetyl Alcohol, Glycerin, Glyceryl Stearate SE, Butyrospermum Parkii (Shea Butter), Avena Sativa (Oat) Bran, Calendula Officinalis Flower Extract, Camellia Sinensis Leaf Extract, Chamomilla Recutita (Matricaria) Flower Extract, Lavandula Angustifolia (Lavender) Flower/Leaf/Stem Extract, Citrus Aurantifolia (Lime) Oil, Citrus Limon (Lemon) Peel Oil, Lavandula Angustifolia (Lavender) Oil, Beta-Glucan, Bisabolol, Inulin, Potassium Hydroxide, Tocopheryl Acetate, Alcohol, Benzyl Alcohol, Coumarin, Limonene, Linalool. • Peppermint: Peppermint Essential Oil, Aloe, Beta-Glucan and plant extracts deliver best velvety razor glide and extremely rejuvenate skin for a smooth, close shave and more supple skin. Ingredients: Certified organic mentha piperita(peppermint) leaf, calendula officinalis (calendula), chamomilla recutita (chamomile) and camellia sinensis (green tea) extracts (aqueous) sorbitol, cetyl alcohol, stearyl alcohol, cyclopentasiloxane, certified organic linum usitatissimum (flaxseed) and helianthus annuus (sunflower) oils, beta-glucan (oat), certified organic aloe barbadensis (aloe vera) leaf juice, babassuamadopropalkonium chloride, hydroxyethylcellulose, tocopherol (vitamin E), arginine (amino acid), ethylhexlglycerin, panthenol (pro-vitamin B5), bisabolol (chamomile), sodium chloride, and certified organic mentha piperita (peppermint) leaf oil. • Aloe Vera Unscented: Aloe Vera Extract, Beta-Glucan and plant extracts restore moisture and promote ideal sleek razor glide for a soft, close shave and nick and irritation prevention. Ingredients: Aloe Barbadensis Leaf Juice, Aqua (Water), Stearic Acid, Caprylic/Capric Triglyceride, Cetyl Alcohol, Helianthus Annuus (Sunflower) Seed Oil, Glycerin, Glyceryl Stearate SE, Butyrospermum Parkii (Shea Butter), Avena Sativa (Oat) Bran, Calendula Officinalis Flower Extract, Camellia Sinensis Leaf Extract, Chamomilla Recutita (Matricaria) Flower Extract, Lavandula Angustifolia (Lavender) Flower/Leaf/Stem Extract, Beta-Glucan, Bisabolol, Inulin, Potassium Hydroxide, Tocopheryl Acetate, Alcohol, Benzyl Alcohol. SHAVING PRODUCTS: Moisturizing Cream Shave, 8 oz. Very Emollient Foam Shave: A natural, hydrating, soap-free, cooling and conditioning formula is packed with abundant botanical emollients for a supple, silky, revitalizing shave. Supplemented with Aloe Vera, Calendula, Chamomile and Vitamin E, this highly lubricating foam helps reduce dryness and chaffing. Enables an easy razor glide and a comfortably close, refreshing shave with less irritation. Aerosol free technology helps protect the environment. Hypo-allergenic. Formulated for men and women. • Mango Vanilla: Exotic vanilla and tart mango provide a tropical fragrance as aloe soothes for healthy skin renewal. Refreshing, smooth shave with an organic blend of aloe vera, calendula and lavender. For all skin types. 5 oz. ORDER TODAY! Ingredients: Water (Aqua), Sodium C14-16 Olefin Sulfonate, Cocamidopropyl Betaine, Sodium Cocoamphoacetate, Aloe Barbadensis Leaf Juice, Ananas Sativus (Pineapple) Fruit Extract, Calendula Officinalis Flower Extract, Carica Papaya (Papaya) Fruit Extract, Hedychium Coronarium Root Extract, Hibiscus Sabdariffa Flower Extract, Lavandula Angustifolia Extract, Mangifera Indica (Mango) Fruit Extract, Passiflora Incarnata Flower Extract, Passiflora Incarnata Fruit Extract, Vanilla Planifolia Fruit Extract, Citric Acid, Glycerin, Tocopherol, Ethylhexylglycerin, Phenoxyethanol, Benzyl Alcohol, Benzyl Benzoate, Coumarin, Limonene, Fragrance (Parfum)..
• Aloe Mint: Cooling peppermint and antioxidant-rich green tea refresh the skin as nutrient-rich aloe provides for healthy skin renewal. Minty cool, smooth shave with an organic blend of aloe vera, green tea and calendula. 5 oz. Ingredients: Aqua (Water), Sodium C14-16 Olefin Sulfonate, Cocamidopropyl Betaine, Sodium Cocoamphoacetate, Mentha Piperita (Peppermint) Oil, Aloe Barbadensis Leaf Juice, Calendula Officinalis Flower Extract, Camellia Sinensis Leaf Extract, Citric Acid, Glycerin, Menthol, Polysorbate 20 Ethylhexylglycerin, Phenoxyethanol, Fragrance (Parfum)..
• Sea Foam: Cooling peppermint and antioxidant-rich green tea refresh the skin as nutrient-rich aloe provides for healthy skin renewal. Vitalizing, smooth shave with an organic blend of aloe vera, green tea and calendula. 5 oz. Ingredients: Aqua (Water), Sodium C14-16 Olefin Sulfonate, Cocamidopropyl Betaine, Sodium Cocoamphoacetate, Mentha Piperita (Peppermint) Oil, Aloe Barbadensis Leaf Juice, Calendula Officinalis Flower Extract, Camellia Sinensis Leaf Extract, Citric Acid, Glycerin, Menthol, Tocopherol, Ethylhexylglycerin, Phenoxyethanol, Butylphenyl Methylpropional, Limonene, Linalool, Fragrance (Parfum). MEN'S SHAVING: Very Emollient Foam Shave, 5 oz. Very Emollient Shave Cream: Very Emollient Shave Cream offers normal to dry skin the shave it needs. This natural, soap-free, conditioning formula is packed with rich botanical emollients for a silky, calming shave. Blended with Aloe Vera, Calendula, Lavender and Vitamin E, this concentrated, hydro-active cream increases water absorption to reduce dryness and chaffing. Provides a painless razor glide and a comfortably close, soothing shave with less irritation. Hypo-allergenic. ORDER TODAY! • Coconut Lime: Nutrient-rich coconut oil moisturizes the skin as aloe soothes and refreshing lime provides amino acids for healthy skin renewal. A cool splash of invigorating island Coconut and Lime will enliven the senses like a tropical sunrise. 8 oz. BUY NOW! • Mango Vanilla: Exotic Vanilla provides a comforting fragrance as Aloe soothes and refreshing Mango moisturizes for healthy skin renewal. Delight in the enticing and indulgent nectar of tropical mango, island honey and pure vanilla. 8 oz. BUY NOW! Ingredients: Aqua (Water), Glycerin, Caprylic/Capric Triglyceride, Carbomer, Citrus Aurantifolia (Lime) Oil, Cocos Nucifera (Coconut) Oil, Glycine Soja (Soybean) Oil, Prunus Amygdalus Dulcis (Sweet Almond) Oil, Simmondsia Chinensis (Jojoba) Seed Oil, Aloe Barbadensis Leaf Juice, Calendula Officinalis Flower Extract, Camellia Sinensis Leaf Extract, Chamomilla Recutita (Matricaria) Flower Extract, Citrus Medica Limonum (Lemon) Extract, Potassium Hydroxide, Tocopheryl Acetate, Alcohol, Benzyl Alcohol, Caprylyl Glycol, Ethylhexylglycerin, Phenoxyethanol, Limonene, Flavor, Fragrance (Parfum). MEN'S SHAVING: Very Emollient Shave Cream, 8 oz. • Moisturizing Shave Cream Sensitive / Fragrance Free: Blended with hydrating Aloe Vera and smoothing jojoba, this opulent cream helps reduce nicks and cuts while softening, moisturizing and protecting sensitive skin. Rich Argan oil, Rose Hips and Shea Butter moisturize to glide razors path leaving silky soft skin. Super-antioxidants Acai and Goji Berry helps fortify and nurture skin. For Men and Women . Hypoallergenic. Fragrance free. Made in U.S.A. 7 oz. BUY NOW! Ingredients: Aqua (Purified Water), Isopropyl Palmitate, Stearic Acid, Caprylic/Capric Triglyceride, Simmondsia Chinensis (Jojoba) Seed Oil, Olea Europaea (Olive) Fruit Oil, Helianthus Annuus (Sunflower) Seed Oil, Glycerin, Tocopheryl Acetate (Vitamin E), Cetyl Alcohol, Glyceryl Stearate Se, Polysorbate 60, Dehydroacetic Acid, Benzyl Alcohol, Hydroxyethylcellulose, Sodium Hydroxide, Argonia Spinosa (Argan) Kernel Oil, Rosa Canina (Rose Hips) Fruit Oil, Phenoxyethanol, Butyrospermum Parkii (Shea Butter) Extract, Aloe Barbadensis (Aloe Vera) Leaf Juice, Euterpe Oleracea (Acai Berry) Fruit Extract, Lycium Barborum (Goji Berry) Fruit Extract, Ficus Carica (Fig) Fruit Extract, Camellia Sinensis (Green Tea) Leaf Extract. MEN'S SHAVING: Moisturizing Shave Cream: Sensitive-Fragrance Free, 7 oz.